Our owner, Rick Harris, worked for corporate America for over 20 years giving him the confidence, skills and dream to launch his own successful business. 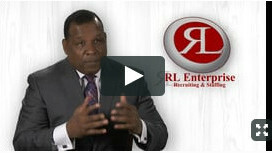 He formed RL Enterprise & Associates, LLC and began to realize his plan to expand on past success. He is known for delivering business results and his passion to help people and corporations succeed. In 2006 he opened the Greenville, SC office location and later expanded to the Charlotte, NC, Easley, SC and Greenwood, SC areas. As a privately held, minority certified company, RL Enterprise is able to dedicate its resources to providing outstanding service for clients whose needs we consider paramount. We are in the people business. We believe people are a company’s greatest resource. We find great people to help great companies meet the goals and objectives of their businesses. We deliver the highest quality service using a success strategy based on our approach to leadership acquisition, assessment and development. We service our customers locally and nationally for a variety of companies including Fortune 100 and 500 companies. At RL Enterprise & Associates, we pride ourselves on delivering the highest quality candidates with a goal to develop long lasting relationships with our clients and candidates, while expanding our service footprint. We know what it feels like to walk in your shoes. We are a small group of successful operations, sales, marketing, finance and human resource managers who understand the needs of your business. We understand that you need more than just warm bodies to show up for work. That’s why we focus on finding you the extraordinary talent you need to get the job done right. We screen them, prep them and teach them about your job before we send them to you. We do this because it makes your life easier and because that’s what we wanted from a staffing company when we walked in your shoes. Our quality commitment is based on a personal and professional standard of excellence in performance, service, and resourcefulness to ensure that the ever evolving and improving customer is always satisfied. In addition, we are committed to constant testing, system evaluation and improvement utilizing technology but never sacrificing the powerful impact of the human element. At the end of the day, our product doesn’t change…its people. The added value with RL Enterprise is that we value people as our resource. We find good talent, take them through our RL process and treat them with dignity and respect whether they are temporary, contract, or direct hire placements. Our mission as RL Enterprise is to bring premier human resource service offerings to organizations in need of placement, growth, and transition support. Find Extraordinary People, Develop Extraordinary People, Ensure Extraordinary Results…Its our "Peopleosophy". We will successfully meet our client’s needs with professional and personalized attention and by utilizing cutting edge resources. We will develop deep, committed relationships and strive to consistently provide successful outcomes. We have over 100 years of combined experience in various fields and industries, such as but not limited to operations, sales, marketing finance and human resources. RL executes and knows having the right people for your company is the greatest resource for your company to achieve maximum results. We value and care about PEOPLE and we understand that quality of people is imperative to your business success. We take serious strides to understand what your company’s needs are to provide you the best candidate for the job. We use new and innovative techniques to match the best candidates for your company to create a win-win situation. RL Enterprise & Associates, LLC promises you exceptional quality human resource support and consultation services that will meet or exceed your expectations. Our quality commitment is based on a personal and professional standard of excellence in performance, service, and resourcefulness to ensure that the ever evolving and improving customer is always satisfied. In addition, we are committed to constant test, system evaluation and improvement utilizing technology, but never sacrificing the powerful impact of the human element. We acknowledge continuous education, training and personnel development combined are the key to organizational success.